Observation - Unknown Caterpiller - UK and Ireland. 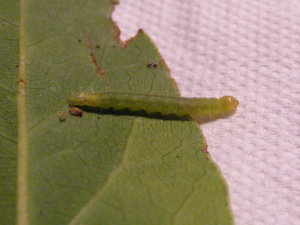 Description: Small green caterpillar. Found on flowerpot containing a bay tree. I have put in a pot with bay leaves but it has shown no interest in them. Small green caterpillar. Found on flowerpot containing a bay tree. I have put in a pot with bay leaves but it has shown no interest in them.